Disclaimer: The current Build are well tested and stable, but support is closed for 2 weeks. Next update and E-Mail/PM support will be back on 3th of Mai. Render faster and spare a lot of money. E-Cycles is a fork of Cycles which renders up to 2.7x faster out of the box when using CUDA GPUs, more using new options. I offer full weekly builds based on Blender 2.7x and 2.8x just like the buildbots, with support for Windows, Mac (2.8 only yet) and Linux. You can buy E-Cycles now on Gumroad based on Blender 2.8x or 2.7x to get all the features that will come in 2019. Their is also a monthly option for 2.8x. You can have a look to the following video for a result of using most of the above mentioned techniques to get about 14x faster render (5 minutes to 22 seconds on a single 1080Ti). A short tutorial showing how the scene was setup is included in all E-Cycles versions. 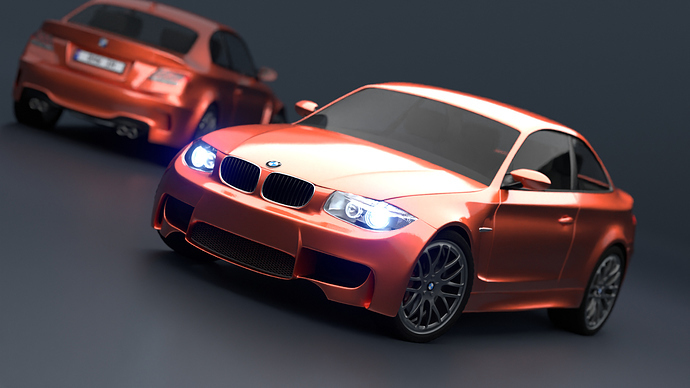 render 1.6x up to 2.7x faster out of the box with CUDA and regular path tracing, using the same settings or render much more realistic images in the same time as the normal release (see table in the FAQ for more details). If you took part to my course, you can get any version at 50% off, just ask per PM. If you provide a proof that you are student (university or college), PM me, you can get E-Cycles 2.8x for 29€/year or 3€/month. it has an option to get the exact same output as master, with still up to 1.7x faster rendering compared to master. You can also learn how I did it with a course to create your own Blender version. Is Radeon pro duo 32GB worth it for cycles? Poll: tutorial to build custom Blender or ready to use builds? Excessive noise in well-lit scene? Better cooperation between devs and artists: Software instead of Hardware? New computer - best hardware for 2019? Is it compatible with Blender? Yes, Blender is actually untouched, only Cycles was modified. So it’s 100% compatible with the official version. Is it worth for me? If you render at least with a 70€ Cuda card supported by Blender on Windows or Linux, you get this build amortized immediately in most cases and on the long run anyway due to the electricity you spare compared to rendering longer or rendering with more cards. Note that it’s GPU only for now. CPU+GPU rendering is still supported but only the tiles rendered by the GPU will be faster. Branched path tracing and OpenCL are still beeing optimized. Can I take only one or two month? Yes, you stay as long as you want, you are free, and you continue to get updates for the month you have paid. The reduced price can apply to the following months if you keep your membership without interruption. Do the build work after my Membership finished? Yes, of course. I even offer a course, with which you can learn how I made the optimizations, how to add new modifiers, customize the UI to streamline your workflow, etc. 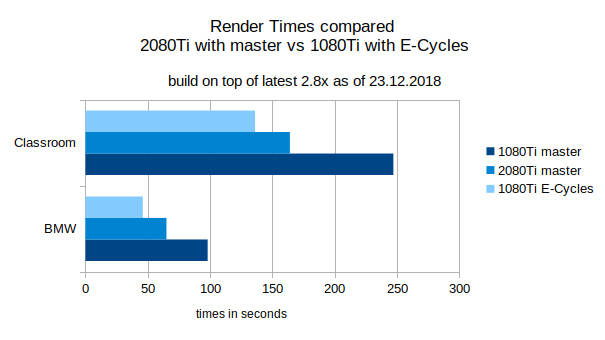 Check other customers render times here in the thread 2070Ti is 2x faster with the BMW Scene, the 980 is about 60% to 80% faster depending on the scene. What can I expect in my case? On Cuda cards, a lot. On a 1080Ti, most of the time you can expect to render 1.65x to 2.42x faster rendering with path tracing (in the time you rendered 1 picture before, you can then render 1.65 to 2.42 of them). The time is for the path tracing itself. Long pre-processing time can make the overall speedup smaller. Here is a table of the times on the 1080Ti and Vega64 to see which kind of scene get which speedup. What if it doesn’t work so well on my configuration ? You have 30 days money back guarantee. If you are provide a real production files where the path tracing phase is less than 1,5x faster using CUDA GPU rendering, you get a full refund. Cases like “my 64 thread threadripper and 1050Ti render nearly as fast with master as with E-Cycles” or “my scene which has 2 minutes preprocessing time and 5sec path tracing render only 2 sec faster” are normal and are not accepted for refund. Again, only the path tracing phase using a CUDA GPU is optimized. Only for Flythrough (only the camera moving) and using 2.79x builds is the preprocessing time done once for videos, which can greatly reduce overall render time. A file also has to be provided, just like for any bug report for any program you buy. What about the cool features added regularly in Blender’s builds? You get free updates every week to always get the latest improvements made in master and there will be 1 feature or optimization added every month. Each feature, after a year, will be uploaded for review on the official tracker. Blender at the time of writing has 1300+ bugs opened. Check first that the problem you experience is not in the latest buildbots and that it’s a bug happening during rendering itself. If it only happens in this build, you can post it here with a blend file to reproduce and your configuration. If the file must be kept private, post it in pm or per PM. The same as in official Blender. AMD drivers however are buggy in their latest version (18.12.2), supported and tested version is 18.5.1. The speed gains are also not as good as with CUDA yet (sometime also 2x faster, but most of the time only 20% faster). All Nvidia drivers tested worked. Is CPU rendering also faster? Not yet. I’m working on normal CPU rendering, maybe it will be added later as a monthly feature. My, that’s a big speedup if true. So what’s the catch? I am expecting nothing less than a secondary bounce solver like Corona UHD cache, RT for the image should exactly be 24:12 (plus some seconds for denoising) because it is Christmas-Time. Joke aside every speedup for Cycles is welcome, will watch this closely! It’s for real, no catch, you have 30 days money back guarantee from Gumroad, so you would get 100% back anyway. if its easy as following this tutorial to speed up cycles by 40%, why dont you want this speed-up to be Master and aviable to everyone ? why dont you share your method to blender devs? is it because its exclusive to a custom build? if so, why and how ?? So your point is that I’m a bad person because I don’t work for free all the time. 3 years of free patches and builds are not enough, I should do it my whole life? You know the Official devs are paid ? Some people here write addons for free, some sell, some do both, but it’s right because it’s python and I’m wrong because it’s C/C++? What the reasoning behind that, please explain? And regarding the posting/giving to the devs: This patch for example: https://developer.blender.org/D2254, lot’s of discussion, happy users who saw real benefits with it https://developer.blender.org/D2254#53699, I rewrote it in 3 parts, still nothing in master. Days lost at speaking. And it’s not only me. You only see the devs staying, but on the tracker, you can find many devs who posted patches, got ignored or rejected for politics and never came back. Speak with the fracture modifier in PM, you will see what they thing about posting patches for inclusion. And at that time, Blender had sometime less than 100 open bugs… Why would that be any better in your opinion now that 2.8 must be made stable with more than 1300 bugs opened, please also explain? In the course, you get the code, so you can do the updates yourself (everything included in this build is in the course) and you can even do the review process for the parts you want to have in master. With this option, I do all the work for my clients during a full year, so that you just have to click to download like for the buildbots. It’s just some people like to do things themself, they can take part to the course other prefer ready to use products with support, they can take this option. Hey calm down, im not criticizing anyone. think by learning everyone how to code in c you are doing a fantastic job. I was just asking how it’s possible to achieve this, that’s all, the only reason I could find is that the code is hardware specific to each user but ,visibly it’s not. That was resolving a lot of questions like why you’re selling a full course about coding aside with this speed up and the incompatibility for it to become master. As I do not plan to buy it, I support your reasoning completely. Sometime it’s positive. Quality code is also important in a codebase many person work with, but sometime it’s based on opinion with few technical arguments, sometime it’s just they have way too much to do and simply have to do choices, but whatever the reason is, in the end it hurts and takes time which can be invested more wisely. @bliblubli my guess is 100 sec. @bliblubli I would guess 4 min. @polygonsoul don’t forget to give your name and email address if you want to participate. If nobody else answers, you 3 get one year of update as there is no other contender. @bliblubli my guess 5 min. @bliblubli My guess is 3 minutes. My guess is 5 minutes 30 seconds.